For 2015: 01 January, 10 January, 13 January, 26 January, 08 February, 12 February, 26 February, 06 March, 11 March, 20 March, 24 March. Overnight Stay at the Hotel in Ayutthaya. Breakfast at hotel and proceed to Uthai Thani. Head to see the Crystal and Golden Halls of Wat Tha Sung. Head-up the mountain to visit Wat Sangklat Rattanakhiri, for the magnificant bird-eye view of Uthai Thani. Continue driving further north to Phitsanulok, lunch and visit to Wat Mahathat featuring Thailand’s most beautiful Buddha image – Phra Puttachinnarat. Visit to Cha Tawee folk museum. After that drive to Sukhothai, a name meaning dawn of happiness and was founded in the 13th century and became the kingdom’s first capital, overseeing a period known as the golden age of Thai history. Today visit Sukhothai Historical Park which was once a walled city surrounded by a moat, the park contains almost 200 ruined chedis in remarkable condition. See the main sites of the Historical Park. Bike ride possible in supplement in the historical park. A nice and easy way to stroll around the ruins! Continue to have the sumptuous local organic lunch is served in traditional Thai style at the open Sala overlooking the rice fields. Continue to Lampang, a large trading centre during the 19th Century. Visit Wat Phra That Lampang Luang, one of the most spectacular temples in Thailand. Dating back to 1486 and is believed to be one of the oldest wooden buildings in Thailand. Visit Wat Pong Sanook, a temple awarded by UNESCO for Culture Heritage Conservation provides an inspirational model of community-led conservation in saving a unique Lanna temple. Then in the afternoon, take a horse cart ride along Taladkao Road where you can see old Thai, Chinese, British and Burmese merchant houses. Overnight Stay at the Hotel in Lampang. Depart to explore the Lanna morning lifestyle at the local market. Depart from Lampang with a stop at archeological gate pass “Pratu Pha” which it historical paintings are believed to be the longest in Southeast Asia, and aged over than 3,000 years old. Then continue north to Phayao situated on the scenic Kwan (Lake) Phayao. Visit the interesting Wat Analyo with its eclectic mix of religious architecture and iconography perched on a hilltop with views of the Lake. Arrival in Chiang Rai late afternoon, visit Wat Rong Khun with its unique “kanok” architecture. Continue your visits with some of the temples of the town, Wat Phra Kaew with its beautiful brass and copper Buddha image. Overnight Stay at the Hotel in Chiang Rai . After breakfast at the hotel, drive to Mae Sai, the northernmost Thai town on the Myanmar border. Walk around the local market, and continue to visit Chiang Saen on the steep banks of Mae Khong River, opposite of Laos where you will see some magnificent ancient ruins and temples. Take a boat ride along the Mekong River to get a closer look at Laos and Burma. 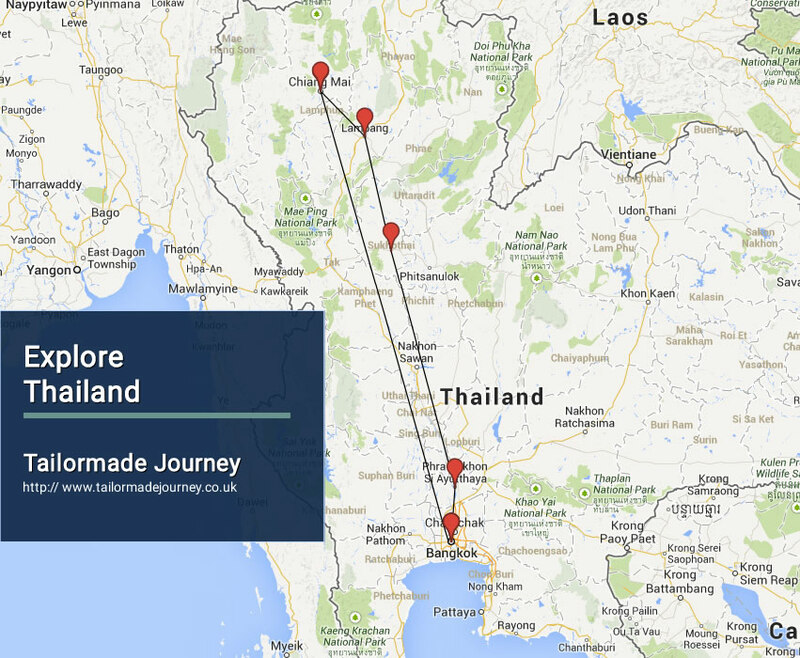 In the afternoon, head South-West towards Chiang Mai. Drive up the mountain to Wat Prathat Doi Suthep, the temple on the mountain, and the most sacred in North Thailand. Your experienced guide will explain the story of the temple, the white elephant and lead you around its impressive chedi and show its beautiful murals. In the late afternoon, the tourist masses have already left the temple grounds and dusk will give a very special atmosphere. After your private blessing ceremony, witness the magical evening chanting of the monks. After breakfast head towards the Mae Ping River banks and Warorot market for a stroll among the colourful stalls. Continue by rickshaw along Tapae road, Chiang Mai’s main street. From the eastern gate, explore ancient Chiang Mai on foot, including the Three Kings monument, the city’s most important temples Wat Chedi Luang, where the famous Emerald Buddha was once enshrined, and Wat Phra Singh home to a very old and sacred Buddha image. Depart to Chiang Mai Railway Station for an overnight train back to Bangkok. Upon arrival in Bangkok Railway Station you are met and transferred to your pre booked Hotel. Today you are transferred to Bangkok International Airport to board flight for Onward Journey.